The world of awkward young males and disapproving father figures often associated with the world of Wes Anderson is polarizing. You have those who absolutely despise his style and those who absolutely love it. Typically I fall into the former. For all his faults, though, he does have a style. Had I seen Fantastic Mr. Fox before Mr. Anderson’s other features, I’d have wondered what he was getting at with all of the others. This is his best, most assured, most mature work , and it’s a stop-motion animation adaptation of a children’s novel. It becomes perfectly clear in this film that all of the characters in Anderson’s other movies really were just cartoon characters. Now that they are in the literal sense, their absurdest actions look and feel right. The stop-motion techniques of the animation greatly help flesh out the emotion and style. The camera work is amateur in the best sense of the word, making this feel like chaos that came together at the last minute. However, there are moments of utter beauty, like the scene where Mr. and Mrs. Fox stand on a bridge as a sewer waterfall collides with their free-falling marriage. 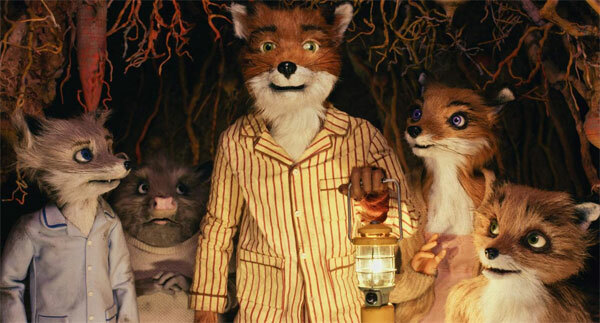 The scene, from the visual beauty, the impeccable voice work, and the writing, sums up what is so fantastic about Mr. Fox’s story. This is a movie about trying to rebuild what has collapsed. Mr. Fox (George Clooney) used to loot local farmers for their wares with his girlfriend (Meryl Streep.) They get engaged while in a cage after she announces she’s pregnant and he, like in so many American marriages in the movies, must settle down and set aside his outlaw ways. Of course he’s pulled back in, but it’s not by any urgent circumstances. He’s simply bored. The freedoms Mr. Anderson takes in adapting Roald Dahl’s classic children’s novel allow him to inject his humor and apply some of his own themes. Instead of casting the young, distraught child Ash (Jason Schwartzman) as the protagonist, he gives center stage to the disapproving father. He isn’t exactly reinventing the wheel, just getting the tires rotated. Impeccable voice work doesn’t hurt anything, either. It’s paramount in the success of an animated movie without Pixar’s reputation. Featured in this movie, I’m happy to say, is some of the best voice work I’ve ever heard in an animated movie from some of the greatest actors working today. Clooney and Streep bring their big names and talent to the project with zest and vitality. Anderson put many of his actors in the same room together, which Spike Jonze also did in Where the Wild Things Are. It makes the dialogue flow more naturally and it seem that much more realistic. Though this is painted as a children’s movie, it is a part of the ever-growing sub-genre of “Kids movies for adults” along with Mr. Jonze’s Wild Things. The farmers Fox steals from actually want to kill him, deliberately saying it many times and wearing his tail as a prize when they cut it off. This is the kind of movie children of all ages would appreciate. In the end, Mr. Fox is a glowing achievement of melding an individual director’s style with source material. Anderson appears to have grown up making this kid’s movie. It’s his best film, and it ranks with Tim Burton’s stop-motion movies as well as many of Pixar’s classics. This entry was posted in Reviews and tagged Adaptations, Best movies of 2009, Bill Murray, Children's movies, Fantastic Mr. Fox, George Clooney, Jason Schwartzman, Kids movies for adults, Meryl Streep, Roald Dahl, Stop motion animation, Wes Anderson by matterspamer. Bookmark the permalink. Its a good film and has Anderson’s signature wit. However, could have been a lot better when it came to its story flaws. I too am in the boat when it comes to not getting Wes Anderson totally agree with you on style. The animation was so flawless it was eerily lifelike (a long way fro Rudolph and the like, that’s for sure). Also the voice actors, as you said, were impeccable.